In the first 24 hours the Slow Miracle Art Store page was “live,” I learned a lot about virtual buttons. If you happened to have tried any of the store buttons out during that time, you may have been a victim of my learning curve. I learned that the “buy now” buttons do not allow people to accumulate more than one item before purchasing. (I guess it never occurred to me that anyone would want more than one item.) So I learned how to change the “buy now” button to a “view cart” button that would allow shoppers to gather the items they wanted to purchase. But then, oh then, I was informed that somehow all 3 of the buttons were placing the greeting cards in the shopping card, as if that were the only item for sale in the store. For most of my life the word “button” meant the kind you see in the photo above; it’s a shot into my mother’s old button jar, which I am lucky enough to have. There’s nothing particularly valuable in it, but they are all special to me: things that fell off suits she wore when I was little, the brass buttons from my old pea coat, and best of all the wooden “Mrs. Button” you see smiling up at us. Long ago it was glued to a drawing of a matronly woman’s body on a book of children’s songs my Mom used to play on the piano for us. So the idea that buttons are full of technical code is a new one to me. That’s why I needed my own personal “validation engineer.” And luckily, I have one. It’s Veronica, of the wonderful blog Gluten Free Vegaquarian. I hope you’ll check it out. She is one awesome chef with a gourmet sense of adventure in the kitchen. She has some tasty low fat offerings and a can-do attitude about how to live well with MS. And she leaves some great comments over here. As with so many of you, her encouragement to open the shop has been very important to my process of gathering the courage to dive in. But I didn’t expect that by trying to be my first customer, she would inadvertently yet graciously become my very own personal “validation engineer,” something she used to do in a former job. As a poet, I love word play. This phrase works on me at so many levels I get giddy with significance about the wonderful sense of creative humor the universe hands over each time I am willing to pay attention. So thanks to Veronica, who patiently persevered in testing the buttons until she was able to place her order, anyone else who decides to do the same will have smooth sailing. I have to laugh. The technical bugs are all worked out (for now anyway), and the real ones are mostly gone for the winter. And thanks to Veronica and Susan, it was fun working them out. As with the little green ones I observed and tried to draw, my sense of awe about the world remains intact. Now this “nineteenth century girl,” as some of my friend have called me, is just a tiny bit less intimidated by virtual buttons with code, options, pull down menus and logging in and logging out. Lucy and Ethel would be proud. I feel so blessed. Next post we will celebrate that blessing with a cookie recipe–bug and button free, of course. Thanks, Maria! You’re too sweet. I’m glad I could help. 🙂 I’m excited to get my order! And thankfully these bugs were worked out pretty quickly. Easiest validation I’ve done! I don’t know why I haven’t been keeping my buttons in a jar!! They’re in a box, all hidden. That one with the face is so cute! 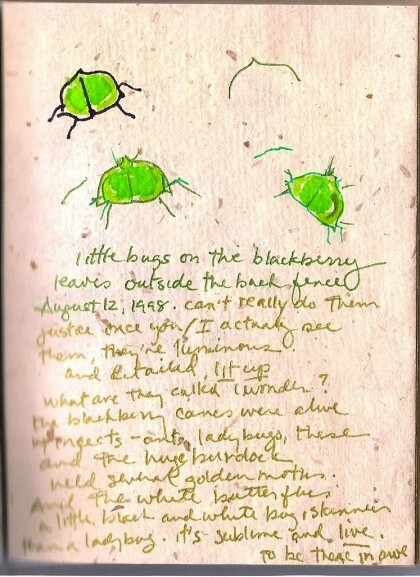 I also love your musings on the green garden bugs. You really have a wonderful way with words. Oh – and cookies??! Cookies are awesome. Can’t wait to read how you tackle them! So glad you had a friend to help with sorting out the website issues. Those things can be tricky! I love the way you reference the blog posts that go with the cards! Just placed my order. Good luck with the store! Wow, Pam, thanks so much!! Your cards may well go in today’s mail, too. 🙂 I’m really glad you like how I referenced the blog posts that go with the cards. I’m feeling blessed by your wonderful support. Hi Maria! I’ve spent the last three or four days reading your blog from end to end…you are an extraordinarily gifted teacher, guide and artist! Your insight is truly inspirational and gently awakens so many ideas in me that have been slumbering lazily for too long. The way you colorfully weave community together with food and hope and humor just rocks in the most positive way! I think a collection of your favorite recipes and your beautiful artwork would make a spinningly cool cookzine! Previous post: The Slow Miracle Art Store is Now Open Online!